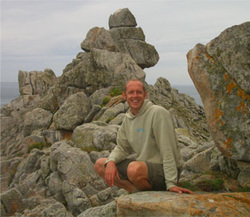 Phil trained in outdoor leadership in British Columbia, Canada in 1997/8, followed by long term mentoring with Thomas Schorr-kon at Trackways (from participant to full instructor). "My first nature mentor was my Granny Ivy, a keen amateur naturalist. I have a keen interest to help all ages find deeper connection with both themselves and the natural world and have been working closely with children and teens in nature connection since 2001. My current personal passion is designing and implementing forms of natural land stewardship and food systems within the existing natural ecology of Sussex.